Short on time in the mornings? Whip up these quick overnight oats for a grab and go breakfast! This post was created in partnership with Bob’s Red Mill. All opinions and text are my own. Thank you for supporting us and the brands that we love. With back-to-school means coming up with creative, on-the-go breakfasts for my little ones. Lord knows how much my oldest loves to procrastinate in the morning getting out of bed and getting ready. So making anything less than what you can grab on the way out the door is not ideal. Thankfully, she loves oatmeal and overnight oats have been a hit as of late. What I love about oats is that they are an incredibly versatile whole grain that you can do just about anything with. They are rich in dietary fiber and all Bob’s Red Mill oats are kiln roasted to give them that wholesome flavor you come to expect. 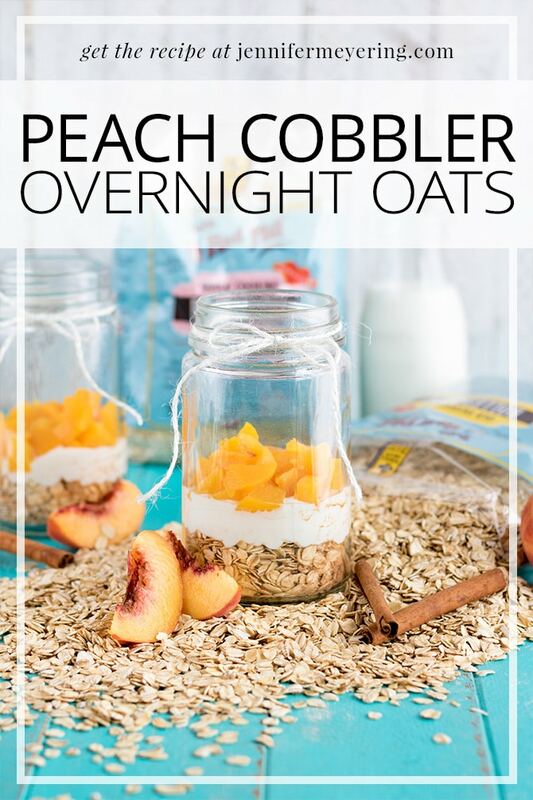 I’ve been experimenting with a bunch of different overnight oat recipes and this peach cobbler overnight oat recipe made with Bob’s Red Mill Oats has been her favorite so far. Lucky for me she doesn’t know that it’s packed full of protein and better for her usual morning sugary cereal. This breakfast is perfect for school mornings because you can make a bunch of them the night before and then just place them in the fridge. The next morning take them out, give them a stir, and you’re ready to eat while running out the door making sure you don’t drop your kid off late at school. Overnight oats are meant to be eaten cold, and while I do enjoy them cold, there are just some mornings – like the snowy, white ones – where I prefer a warm breakfast. And these are perfect for that too… after giving them a little stir, place them in the microwave for about a minute then stir again and done. Nice, warm overnight oatmeal for breakfast on the go! Add all ingredients into glass jar or tupperware with lid and stir until fully combined. Add peach slices on top and close lid. Place in refrigerator for at least 8 hours or, ideally, overnight. Eat and enjoy the next day. Overnight oats are meant to be eaten cold but if you like your oats warm (like I do) then just heat them up for about a minute or so in the microwave just before eating. My coworking and I were just talking about overnight oats this morning. She purchased a jar from some health food store for breakfast today and it set her back over $7! I can’t imagine homemade costing anywhere near that amount! Perfect timing on this one, Jennifer; can’t wait to impress her with a homemade version! Oh gosh, no! There is no way that this is even close to that price! haha, it amazes me the amount of money some people spend on pre-made meals. I usually make “overnight oats” using steel cut in the slow cooker, but this is a great grab and go idea. The layering presentation is super cute too! I have some steel cut oats and I’ve been wondering how to make them. I’ll have to try your overnight slow cooker method.